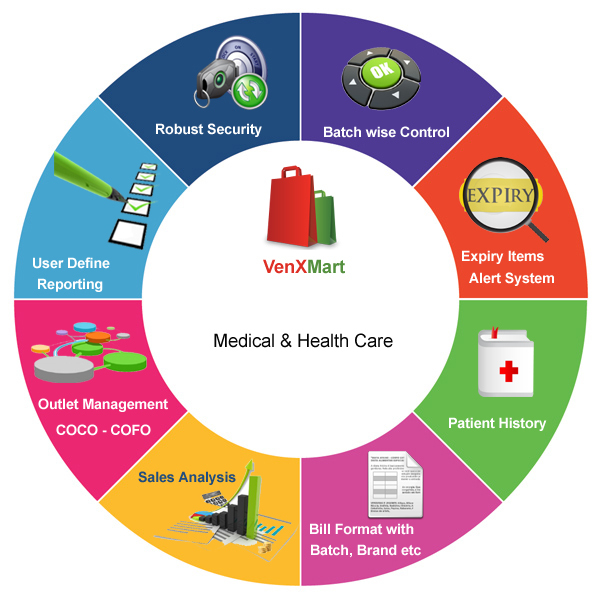 VenXMart is a complete Retail & Wholesale Management System that offers small and mid-market retailers a complete point-of-sale solution that can be adapted to meet unique retail requirements. This powerful software package automates POS processes and store operations, provides centralized control for multi-store retailers, and integrates with other popular applications. Batch number wise stock reports. Expiry alerts for batch numbers. Age calculation for batch numbers. Pickup the item from its batch number. Easy management of brands and its movements. Patient History can be maintained in the software. Bill can be done in the name of patient. Patient wise history reports are available here. Patient records can be tracked in the software. User can define his own bill format at the time of installation or can use our predefined bill formats. Batch number and brand or any other details can print on bill according to the user specifications. Print on laser jet or dot matrix printer can possible. For any other formats user has to specify to our technical team in advance.